We've discussed this before, but it's worth mentioning again: movies are fiction. Even film's which are "based on a true story" often take liberties with the facts and the characters so that what we see isn't 100% true. But, that doesn't change the fact that we can learn things from movies. And if I've learned anything from decades of cinema, it's that traveling abroad is dangerous. How many movies have shown Americans journeying to other countries and having bad things happen to them? Robbery, torture, death -- it's all disturbing and enough to convince me that I'm better off enjoying a staycation. Well, add No Escape to that list, as it shows us that even family's aren't safe. As No Escape opens, we are introduced to Jack Dwyer (Owen Wilson) and his family -- wife Annie (Lake Bell) and their young daughters, Lucy (Sterling Jerins) and Beeze (Claire Geare). They are traveling to an unnamed Southeast Asian country so that Jack can begin a new job. While on the plane, they meet Hammond (Pierce Brosnan), a veteran traveler. Once they land, Hammond gives the Dwyer's advice on their trip. The family reaches the hotel and attempts to settle in. Unbeknownst to them a coup has taken place, and angry protesters have taken to the streets. The next morning, Jack heads outside to get a newspaper and immediately witnesses a violent scene. He returns to the hotel to collect his family and they realize that they are in a desperate situation in which they must find a way to leave the city before the violent locals find them and kill them. No Escape comes from brothers John Erick Dowdle (Director/Co-Writer) and Drew Dowdle (Producer/Co-Writer), who have a somewhat interesting background. In 2007, they completed a film called The Poughkeepsie Tapes, which got solid reviews...and then was never officially released. (It didn't get truly "released" until it became available on DirecTV on 2014. I still haven't seen it.) This got them the gig making Quarantine, the American remake of the Spanish classic [Rec]. This lead to Devil, a movie written by M. Night Shyamalan. While neither of these movies were huge blockbusters, they had some clout behind them, so the Dowdles were getting attention. They continued to focus on horror, bit took a big step backwards with the ridiculous As Above So Below. With No Escape, these cinematic siblings have turned their backs on horror. It that a good thing? 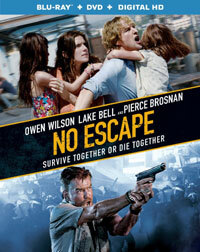 Apparently it is, as No Escape is the best film which they've made so far. (It's really hard to judge just how "good" Quarantine was, as it was simply a nearly identical remake of another movie.) I can tell you that from the previews, No Escape didn't look like my kind of movie. But, the Dowdles have managed to craft a thriller which is slick and suspenseful. It doesn't waste much time it allowing the action to begin and once it does, things rarely let up. The set-pieces offer a nice combination of the characters running, jumping, and dodging bullets, so that the whole thing doesn't become too redundant. The inclusion of a family, complete with small children, is a somewhat cheap ploy, but it also makes us care about the characters. The movie held my attention until the very end, which truly surprised me. But, let's not let those points go to No Escape's head. While it's not a bad movie, it's not a great one either, as it has it's miscues and flaws. For starters, this isn't very original. The story takes the classic "stranger in a strange land" story and blends it with a modern look at unrest in foreign countries where the government breaks down and chaos reigns. However, this also leads the film into what could easily be labeled some racist material. The country where the story is taking place is never identified (although we do learn that it's right next door to Vietnam, so we can make some guesses), but it is chock full of very stereotypical Southeast Asian characters who are ruthless killers. As noted above, the pacing is good and the movie contains a variety of action, but after a while we get a little tired of watching this family on the run and about 10 minutes of this could have been cut. And I know that kids often don't do what they are told, but they two girls here keep making bad decisions which place the whole family in jeopardy. Does the movie want us to hate them? So, in the end, No Escape is a solid B-Movie, but it's nothing great. You can certainly do worse with a rental and the movie offers enough action to be appealing. It could easily be argued that the most interesting aspect of the movie is the performance of Owen Wilson. You have to go back to 2001's Behind Enemy Lines to find the actor in a serious, action-oriented role. He certainly does well here, and the fact that we've seen him in such likeable roles gives Jack instant appeal. This helps to carry along a movie which has its ups and downs, but is a nice distraction. Now, let me get back to planning my domestic vacation. No Escape takes away your pool privileges on Blu-ray Disc courtesy of The Weinstein Company. The film has been letterboxed at 1.85:1 and the Disc contains an AVC 1080p HD transfer which runs at an average of 28 Mbps. The image is very sharp and clear, showing no overt grain and no defects from the source materials. The colors look very good, and the image is never overly dark or bright. The level of detail is excellent and the depth is notable. Overall, a very nice transfer. The Disc carries a DTS-HD Master Audio 5.1 track which runs at 48 kHz and an average of 4.0 Mbps. The track provides clear dialogue and sound effects. This track really comes to life during the action sequences. The explosions rock the subwoofer and the surround sound effects are very impressive when the violent mobs appear on-screen -- we feel that we are being swallowed into them. There are more subtle sounds which emerge from the front channels. The No Escape Blu-ray Disc contains only a few extra features. We begin with an AUDIO COMMENTARY from Writer/Director John Erick Dowdle and Writer/Producer Drew Dowdle. The Disc contains two DELETED SCENES which run about 5 minutes and can be viewed with commentary from John Erick Dowdle. This offers two additional scenes with Brosnan, but no new subplots or information. "Behind the Scenes" (14 minutes) is comprised of four sections, "Owen Wilson", "Lake Bell", "Pierce Brosnan" and "The Dowdle Brothers", which are simply comprised of clips from the film, interviews with those named above and a smattering of on-set footage. These pieces focus characters, the story, stunts, and the locations.